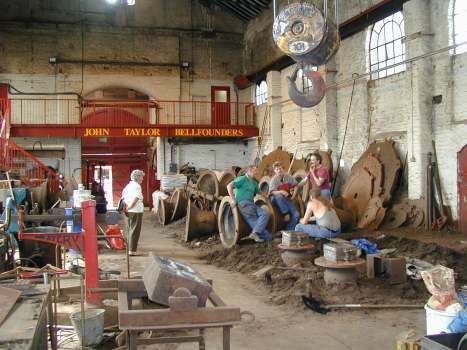 Eleven members of the parish, including the vicar Jill Groves, visited John Taylor's works in Loughborough on Thursday 30 June 2005 to witness the casting of the new bells, made possible by the wishes and generous legacy of Kath Cooke. 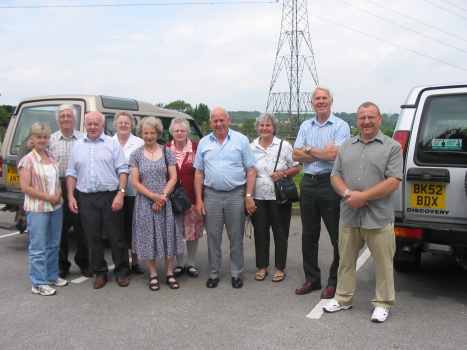 We set off from Cardington at 9.30, stopping for coffee at the M6 Toll services and for lunch at the George Inn, Coleorton, and arrived at John Taylor's at 1.30. Thanks to Nick and David for doing the driving. 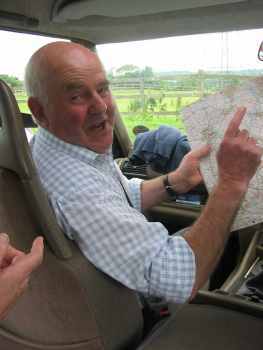 Chief navigator Robin did a grand job and ensured that we were dead on time everywhere by cunningly inserting adjustments to the planned route such as a spin up and down the A38 or a tour of Loughborough town centre when required. 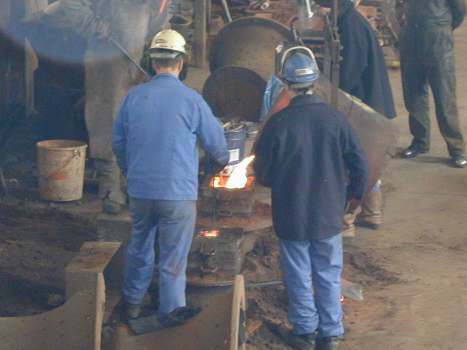 We were joined for the works tour and to see the casting by members of the public including some from the USA, Canada and New Zealand. Our guide, Mr Alan Berry who had been involved with the previous augmentation of St James's bells in 1990, made it clear in his introduction that this was very much Cardington's day, and praised the dedication and hard work of Tower Captain Michael Pickering as the driving force behind the project. We saw and had described to us all the stages in making a bell. 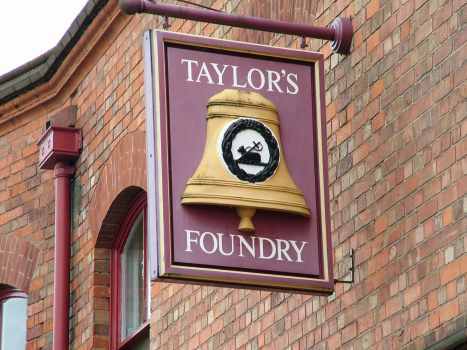 No attempt will be made to cover that here, if interested have a look at Taylor's website www.taylorbells.co.uk. 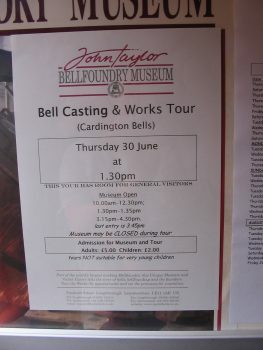 The pictures to the right show what we saw of our bells plus one or two of the various stages in making a bell. "Well, that's where I'm going." 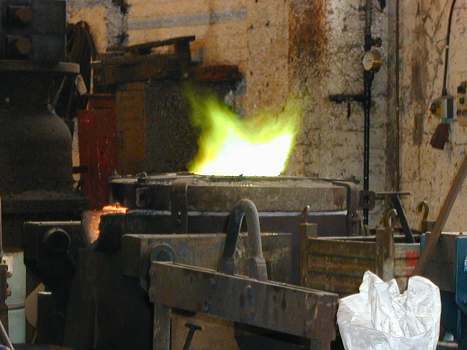 The bellmetal (an alloy of 77% copper, 23% tin) for our bells being heated in the furnace. 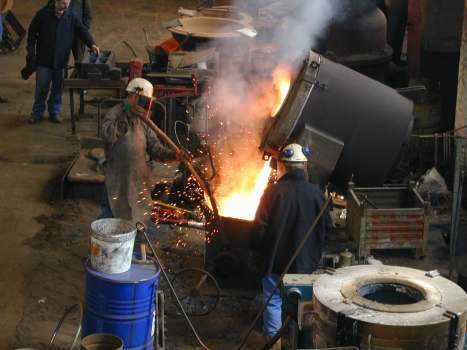 The molten metal being poured from the furnace. It is being stirred with a willow branch to release gasses, one of the long-established traditional processes in bellmaking. 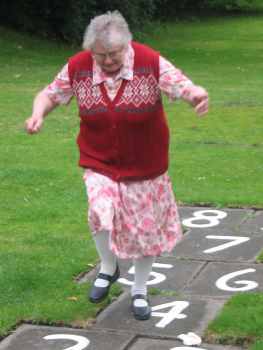 The new Number 2 being cast. The Treble has already been done and is being stirred in the foreground. 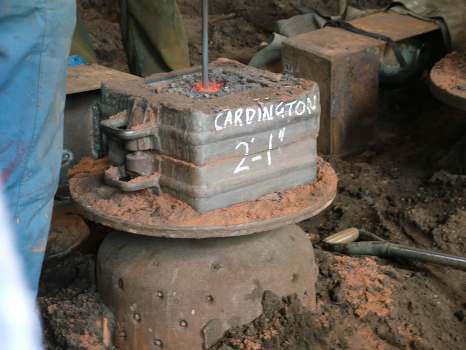 Most of the bell is buried in the sand, just the top of the mould is visible. As it cools, the metal contracts and more is drawn in from the reservoir on top through a narrow neck. This needs to be kept open by stirring for half an hour or so. Taking a break after a job well done (we hope). The bells remain buried in the sand for several days to cool. 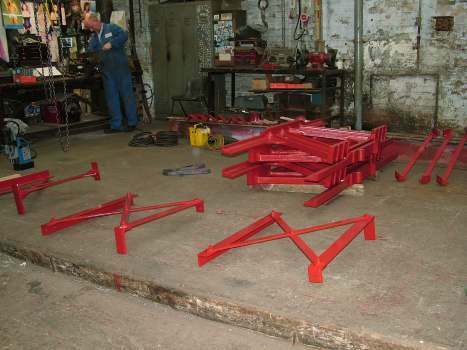 The components of the extension bellframe for Cardington. 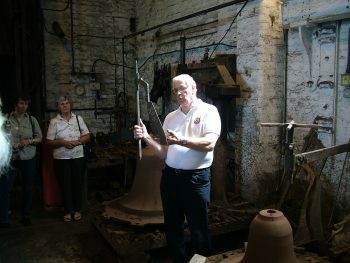 Alan Berry holding a crook, which is used to form the inner and outer profile of the mould into which the bell metal is cast. Five main notes are produced from different parts of the bell. 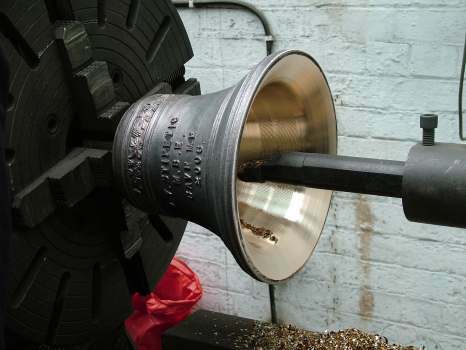 These are tuned by machining metal from inside the bell.